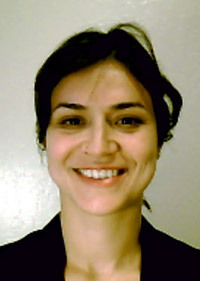 Dr. Patricia Abellan at Pacific Northwest National Laboratory earned the Best Ph.D. Thesis in Material Science in the biennial 2011-2012 award from the Microscopy Society of Spain. Congratulations to Dr. Patricia Abellan at Pacific Northwest National Laboratory on receiving the Best Ph.D. Thesis in Materials Science award from the Microscopy Society of Spain. She conducted her doctoral research at the Autonomous University of Barcelona. There, she studied how strain state and interface structure in oxide nanostructured materials grown by a solution route changed the material's superconductivity, magnetism and other properties. She also discovered a novel mechanism for lattice parameter relaxation. At Pacific Northwest National Laboratory, Abellan is obtaining and analyzing in situ electron microscopy images of nanomaterials in liquids. This work is part of the Chemical Imaging Initiative. She is also on the team installing the dynamic transmission electron microscope in DOE's EMSL, a national scientific user facility. The microscope will allow detailed study of chemical and biological structures with nanosecond to microsecond temporal resolution. Dr. Nigel Browning and Dr. James Evans are mentoring her on these projects. On September 20 at the society's biennial meeting in Tarragona, Spain, Abellan talked about her thesis research. Her thesis is titled Interfacial Structure and Microstructural Evolution of Solution-Derived Dissimilar Oxide Nanostructures: Implications on Their Functional Properties. She also spoke on her PNNL research.